Maybe it’s typically Canadian to have fumbled the football that was supposed to be our celebration of 150 years of nationhood. That’s one conclusion we can make about this year’s sesquicentennial events. For one thing, the focus on 150 years seems trivial. It’s a time span that disregards the histories of peoples who have been living on these lands for much longer than that. While probably not its goal, the 150 has ushered in a wider awareness of this legacy. Most cultural events in the city now begin with an acknowledgement that they are happening on traditional, or unceded, Indigenous territory. The 150 has apparently been a catalyst for this practice to be widely adopted. So while not exactly a bust, the most impressive accomplishment of 150 is how it expanded the discussion about who makes up Canada. Which brings us to Illuminations, a “participative artwork experience,” that happened in Rouge Park from October 5-7. The event found its premise in questioning the 150 time frame. A collaboration between the artist Sarah Fuller and Montreal-based multimedia lab Moment Factory, the project also showed in Banff National Park earlier this month (the Banff Centre is the producer of the event). The project sidesteps questions of nationhood. Instead, it focused on ecologies of the park that expand the celebration to a time frame of 10,000 (or more) years. Scarborough’s Rouge Park has the distinction of being Canada’s newest national park. Established in 2011, this work in progress has long-term ambitions to become the largest urban park in North America. It’s a gorgeous setting, one the Illuminations team clearly had no intention of upstaging. A multimedia experience presented at night in nature lends itself most readily to things like images projected onto trees using projection mapping technology – and Moment Factory is known for creating exactly these kinds of amped up visual extravaganzas. Maybe you saw their “kinetic installations” staged for Madonna or the Red Hot Chilli Peppers while on tour? Or enjoyed the “experiential marketing” they devised for the 2014 Super Bowl, or any of myriad similar events staged globally? For their Banff collaboration, Moment Factory and Fuller took quieter approach. 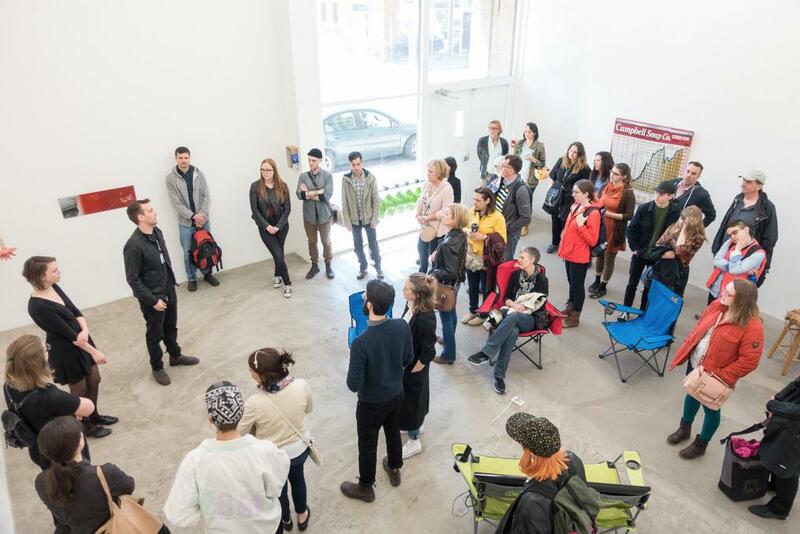 Gathered into small groups, visitors received tools to mediate their experience of the park: backpacks, flashlights, maps, projectors and a lantern that activates short multimedia interludes at wayfaring stations throughout the site. 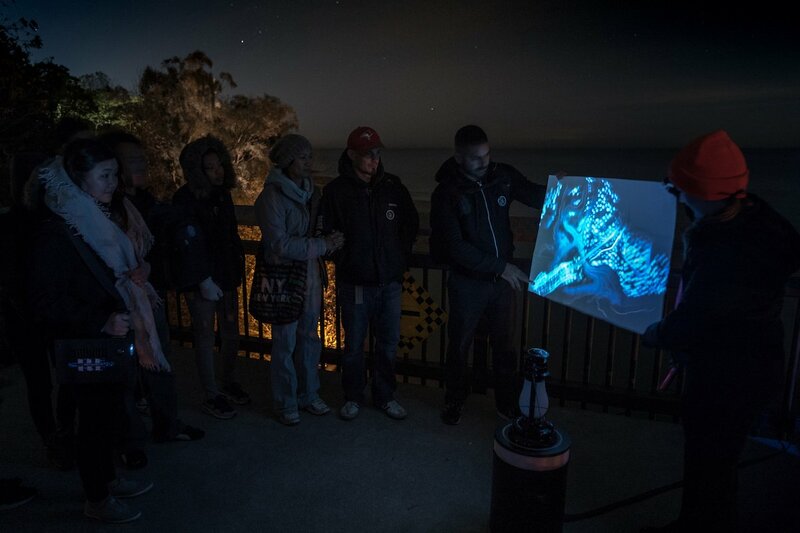 At each station, the groups were told a story about the history and ecology of the park, with visitors using the handheld projectors to cast images that were accompanied by voice-over narration. It was a gentle, meditative experience. Images of the region’s endangered Blanding’s Turtle were cast on the sand, creating a ghostly picture that reinforced the message that it’s a threatened species the park is working to conserve. The tour ends with a gathering around a fire, evoking the idea of groups who have gathered in this way for millennia – though most such groups no doubt enjoyed a real fire and not the simulated one Illuminations devised (likely for insurance purposes). An artist with an expanded practice in photography, Fuller has done experiments in video, public commissions and collaborations with members of the public. The baseline throughout is an engagement with landscape, often in the more northern environs of the country. Her sensitivity as an artist came through in her photographs, particularly in a wry series documenting her former colleagues (and eventually herself) leaving the Banff Centre, an arts centre in the mountains where no one ever stays for very long. Fuller has noted that 150 years is a mere speck in time when compared to “the larger continuum of geological, ecological and human history” of the country we now call Canada. Her commitment to making the importance of this continuum evident began with the negotiations visitors undertook while navigating the park. The small gestures of carrying the lantern or pointing the projector (to show, for instance, images of the Blanding’s Turtle) suggests ideas of stewardship. The message might be subtle, but efforts to reveal the hidden ecologies of the site emphasized their fragility – and the role humans can play in either preserving or destroying them. Aside from the somewhat forced encouragement to our group of visitors to “bond,” and a few technical glitches, Illuminations succeeded in its goal of putting human scale – and national celebrations – into perspective alongside the vast expanse of planetary time. You are currently browsing entries tagged with NOW Magazine at Army of YouTube.